The Wolfe Pointe Property Owners Association will continue to pursue other options for the residents of this community, and this page will be updated as additional information and new options become available. You could also contact your own waste hauler to find out if they will pick up separated yard waste. The WPPOA board is currently gathering additional information as well. There will be a ban on the disposal of yard waste for the Sandtown Landfill and Jones Crossroads Landfill effective January 1, 2011. The Department of Natural Resources and Environmental Control (DNREC) has issued this ban as part of the landfill expansion permit conditions. This means yard waste cannot be disposed of in the landfill but yard waste that is separated and not mixed with trash can still be brought to DSWA Landfills and Transfer Stations where it will be placed in a separate area for recycling. 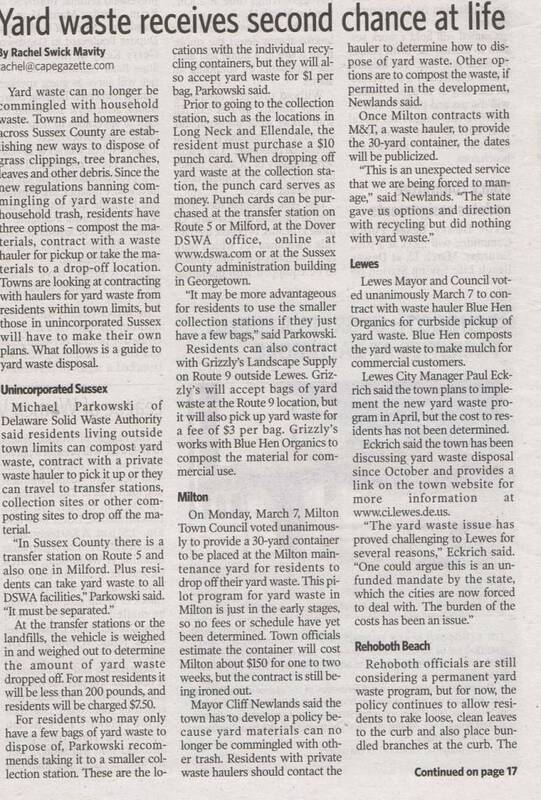 Yard waste can be brought to any of the five DSWA Collection Stations starting January 1, 2011. Collection Station tickets must be purchased in advance to use these facilities. There is a fee of $1.00 per bag for yard waste brought to the Collection Stations. For more information on DSWA yard waste programs please call the Citizens’ Response Line 800-404-7080. The Following is a list of links to useful information on disposing of your yard waste now that it is illegal to put it out with your regular trash collection. After clicking on the following links, use your browser's back button to return to this page. For Homeowner Yard Waste Options Click Here - This is a link to the state information page with some good information on your yard waste disposal options. 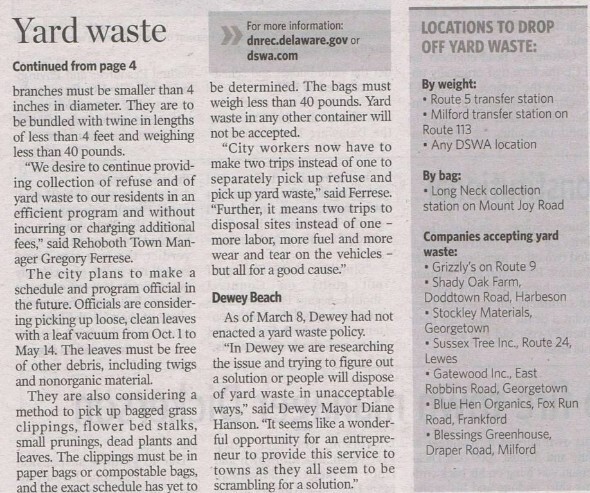 For a list of Yard Waste Drop Off Sites, Click Here - Sussex county sites begin on page 4. For a list of of Yard Waste Collections Options, Click Here - Sussex county sites begin on page 5.